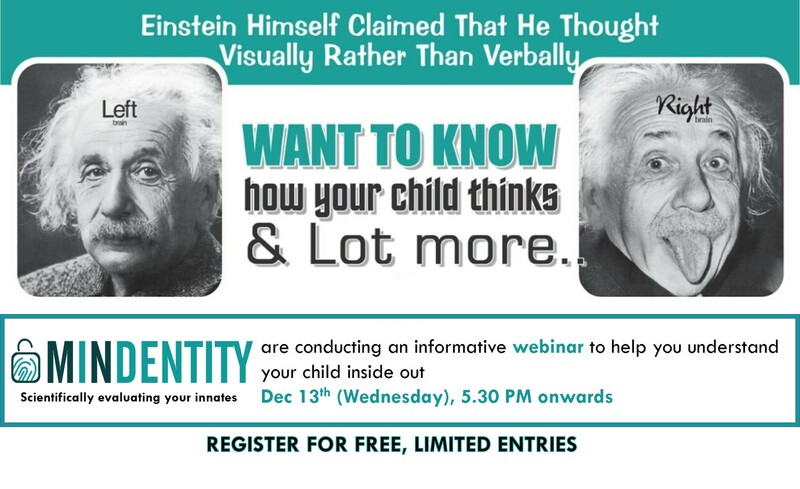 Webinar on Knowing How your Child Thinks | Webinar Workshop at Adyar, Alapakkam, Alwarthirunagar, Ambattur, Anna Nagar, Ashok Nagar, Avadi, Ayanavaram, Chenglepet, Chetpet, Chitlapakkam, Choolaimedu, Chromepet, Egmore, Gopalapuram, Guduvancheri, Guindy, Gummidipoondi, K.K Nagar, Kelambakkam, Kilpauk, Kolapakkam, Kolathur, Korattur, Korukkupet, Kotturpuram, Madipakkam, Medavakkam, Mogappair, Mylapore, Nallur, Nandanam, Nanganallur, Neelankarai, Nungambakkam, OMR, Palanjur, Palavakkam, Pallavaram, Pallikaranai, Parrys, Pattabiram, Perambur, Perungudi, Poonamallee, Porur, RA Puram, Redhills, RK Nagar, Selaiyur, Sholinganallur, Sowcarpet, Sriperumbudur, T.Nagar, Tambaram, Thalambur, Thirumazhisai, Thiruvanmiyur, Thiruverkadu, Thiruvottiyur, Triplicane, Vadapalani, Valasaravakkam, Velachery, Vepery, Villivakkam, Virugambakkam, West Mambalam, Aminjikarai, Annanagar, Ponneri, manapakkam, Madhavaram. Ever wondered why your child is weak in studies? Confused what activity or hobby should you put them in? SchoolConnects in partnership with Mindentity is conducting a Digital Webinar on 13th December to understand the natural tendencies, learning style and skill set of your child using their bio-metrics. This will help you to understand, which Education board will best fit your child, what activites your child would be interested in, best parenting practices and a lot more. Curious and want to know more? Participate for free of cost, Register here !! At MINDENTITY, we help scientifically evaluate the innate nature, tendencies and skill set of an individual by capturing his / her biometrics. This analysis gives a comprehensive idea of how each one’s brain is designed and various crucial questions could be answered with recommendations for improvement areas and further strengthening of the strength zones through the one to one report discussion that is the most insightful and impactful part of the experience. MINDENTITY collectively with its franchise partner BRAINBOW, has successfully completed almost 14,000 report analysis and counting. We bring in such credibility and experience in our offering and are best in the industry in terms of report accuracy, interpretation and analysis and one to one report discussion.